Okay, so maybe desserts are the last thing you want to think about right now. I know! I totally get that! But one year I had banana wontons on New Year’s Eve and now I always associate them with the New Year. So this is my New Year’s recipe, posted a little bit in advance. The best thing about these wontons, aside from how flipping easy they are to make, is that it’s the kind of dessert that seems like it would be high in calories, but it’s totally not. Each wonton is only about 30 calories (depending on the brand of wonton wrappers you use), so a serving of four is completely doable as a dessert or snack. I used to make these by spraying them with my oil mister and while that works out well, I’ve found that brushing them with melted coconut oil is even better–they are thisclose to having the same crispy texture as deep-fried wontons. But since this is a New Year’s post, healthy banana wontons would be a wee bit disappointing, right? So if you want to go all out, I’ve included a vegan caramel sauce recipe too–a coconut caramel sauce recipe, to be exact. The coconut-y flavor is the perfect pairing for the banana wontons. And if you really want to go all out, serve the wontons and coconut caramel sauce with some vanilla ice cream. 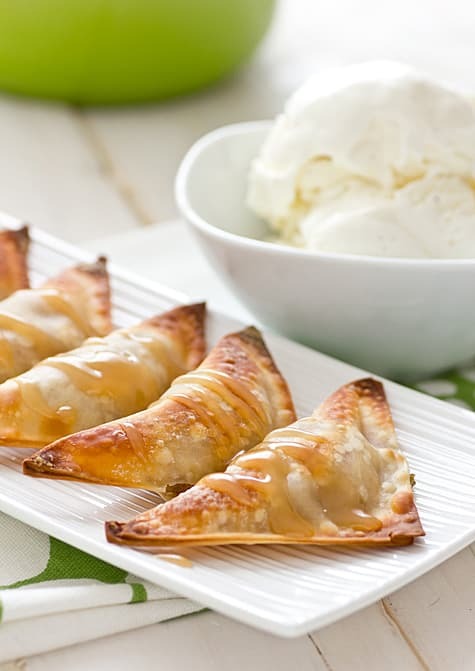 These crispy baked banana wontons are perfect by themselves, but they’re even better when served with ice cream and coconut caramel sauce! Combine cinnamon and banana in a small bowl. Place a heaping teaspoon of banana filling in the center of each wonton wrapper. Brush edges of wrapper with a small amount of water, fold into a triangle, and press edges together to seal. Brush both sides of each finished wonton with coconut oil (or spray both sides with oil or cooking spray). Place wontons on a baking sheet. Bake for 8-10 minutes or until corners are browned and crispy. Whisk together coconut milk, vanilla, and salt in a small bowl. Set aside. Combine sugar and water in a small heavy-duty saucepan over medium-high heat. Do not stir! Allow mixture to come to a boil. Once it begins to boil, watch it like a hawk. Eventually the mixture will start to smell like caramel and turn a golden color, then light brown. This will take about 6 minutes. When you see that it’s started to turn brown, slowly pour in coconut milk mixture, whisking constantly and quickly. If the sugar hardens around the whisk, don’t worry; it will melt. Just keep whisking! Continue to heat over medium-high until mixture has thickened and is a light caramel color, about 5 minutes more. Drizzle over wontons and ice cream. Many supermarket brands of wonton wrappers contain egg, but eggless brands are easy to find at Asian markets. You can also make your own wonton wrappers–here’s a vegan wonton wrapper recipe from Food.com. These were a snap to make! They’re decadent without being too sweet or heavy. That coconut caramel recipe is keeper! ok, I totally want to try this!! SO GOOD! and so easy to make! I did use a coconut palm sugar to make the sauce so it turned out a little darker, but, oh my goodness, so delicious! I am going to make these again next week for my kids! oh yeah – I couldn’t find vegan wonton wrappers, so I used pot sticker wrappers and pan fried them……..
I’m glad the pot sticker wrappers worked out! I’ve heard that gyoza wrappers are also vegan. I’m so happy you enjoyed the recipe! I like the baked version, I made them using bananas dipped in sugar wrapping them in wonton wrappers in spring roll style and pan frying them!! Yum!! I love that idea! I thought about wrapping whole bananas like that, I’m glad to hear it works out! Can you freeze these before baking? I haven’t tried it myself, but I think it would work! Thanks for the great recipe! I tried it out tonight and I got rave reviews from the family. I added a little cinnamon sugar to the recipe as well. Turned out great! What could we use as an alternative to the coconut milk? 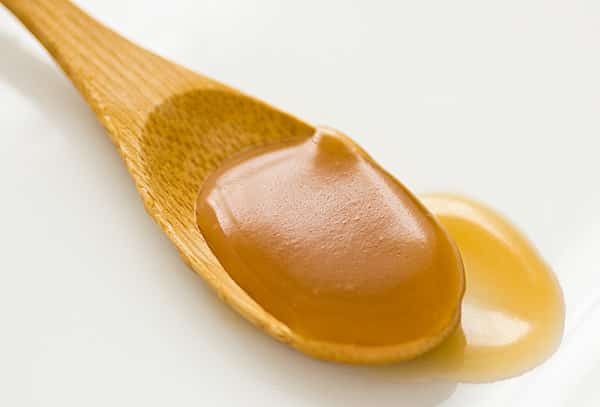 You could make a traditional caramel sauce with cream–the method would be different, though. These were so yummy, and super easy. I used the “banana glue stick” method for sticking them together – just cut the last 1″ off the end of the banana, then cut a ring of peel away so I had a handle. Thanks so much for this recipe – it was a great success. Now I’m going to go wonton wrapper crazy… what else can I put in these little yummies!? Do you serve these hot or cold ? These were amazing. Since my little brother doesn’t like cinnamon, I mixed in crushed peanuts. The sauce was also amazing but I only make the sauce once in a while to watch help my waistline. Thanks for such a wonderful recipe. I just made these last night. it was so simple and so good! Thanks!!! I’m glad to hear you enjoyed them! Can you tell me if you have prepped the wontons in advance and held them before baking without the wrappers drying out? If so, what would be the best way to hold them so the wrappers don’t dry out? I’ve never tried making these in advance, so I’m not sure. If I were to try it, I think I’d put a damp paper towel in the bottom of a tupperware container, put the folded wontons in there, then put another damp paper towel on top. I’m glad you enjoyed the recipe! I wouldn’t leave wonton wrappers on a damp tray or paper, as they will stick and you won’t be able to separate them from the plate or each other. Just place folded wontons on a clean dry plate or on baking paper and cover with a tea towel, they might dry out a little but it won’t affect the cooking/baking process. I would think that the basting with coco oil would seal them so this will reduce the drying out affect. Also depends on how much time in advance you are making them.